Delivered promptly and well-packed. Batteries in good physical condition and as specified, but of course only time will tell how good they are in use. Good price and a direct replacement for the batteries in my APC UPS. Batteries arrive very well packaged. A fraction of the price of the "official" replacements, for about 20 minutes of messing around. Sticking together the pairs with foam tape, then moving the original fuse blocks, and connectors over. Courier was great, warned me that they would be late due to an accident on the motorway. Will use again when I do the other UPS. The reason that I gave 2 stars is that the batteries came with very low voltages. This low voltage can be an indication of an early life failure. The lowest voltage was 7.2 volts. On a 12 volt battery, this is not good.I installed them in to the UPS and they seem to have charged up ok. I would have preferred that they had been swapped out but the solutions offered were not conducive to this action. Very prompt delivery. Fixing screws included, a nice touch. Can't, of course, comment on longevity of batteries yet. 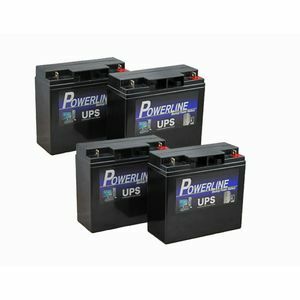 Great value when you need to rebuilt your UPS battery - much cheaper than the pre-built and just as good These loose batteries replace those that are pre-assembled for your specific UPS. You'll need to take and reuse some parts from the originals - the connectors, the block-style fuse and the terminal covers, then use double-sided tape to join the batteries together. Since that is the construction method of the originals then it seems quite good enough. You'll need the appropriate spanner, a cross-head screwdriver, the double side tape and about 30 minutes to do the whole job. Simple. Quick. Cost-effective.